when we were in college, ryan had a roommate who was obsessed with cheez-it crackers. they were his go-to snack at just about any hour of the day. 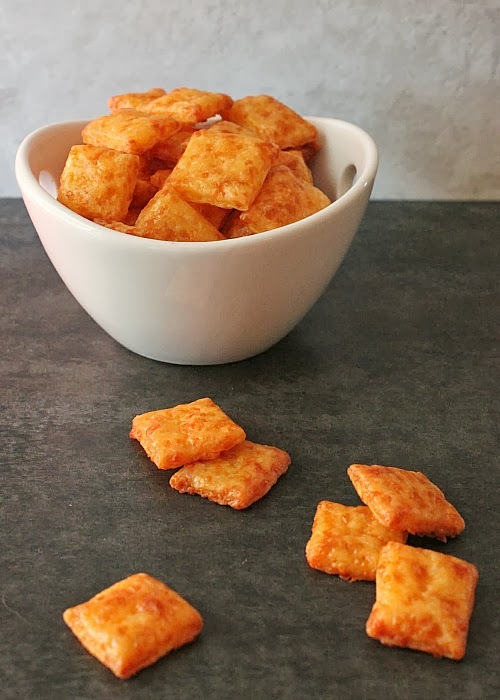 no doubt, cheez-its are a classic, but they are loaded with a long list of mystery ingredients and i find them to be incredibly salty. so, the other day i decided to make my own homemade version of cheez-its. these crackers were super simple to whip up (only 4 ingredients!) and they were absolutely delicious. they were packed with an incredible cheddar cheese flavor (and no artificial ingredients, which is always a bonus). in addition to being super cheesy, the homemade cheez-it crackers were crisp on the outside with a buttery finish. i highly recommend making your own cheez-its, but watch out, they are seriously addictive. consider yourself warned! in the bowl of a stand mixer fitted with a paddle attachment, mix the cheese, butter, and flour on low. the dough will be pebbly. while the mixer is running, slowly add the water. mix until the dough forms into a ball. pat the dough into a disk, wrap the dough with plastic wrap, and refrigerate the dough for 1 hour. after the dough has chilled for 1 hour, remove the dough from the refrigerator. preheat your oven to 375 degrees F. divide the dough into two pieces and roll each piece of the dough into a very thin rectangle. cut the dough into small squares using a pizza cutter. transfer the small dough pieces to baking sheets lined with parchment paper. bake for 15 minutes, until the crackers are puffed and golden brown. watch the crackers carefully so that they do not burn or turn too brown. remove the crackers from the oven and allow them to cool completely before serving. store in an air-tight container. I enjoyed them and they are so easy to make. And of course healthier than the ones with all the junk in them. Nurul - the crackers would probably stay fresh in an air-tight container for about 2 weeks.